Completion of our SQL Server Developer path is recommended, but not required. You should have a basic familiarity with the concept of relational databases, as well as a basic understanding of Microsoft SQL Server and the primary tools within it including Management Studio. You should know the fundamentals of Transact-SQL to write basic queries to retrieve and update data, and how to execute scripts using the Query Editor. It would be helpful, but not absolutely necessary, to have experience with .NET development using Visual Studio 2010 or later. SQL Server Analysis Services (SSAS) is part of the Microsoft suite of SQL Server Business Intelligence tools, or BI tools, that focuses on analytics and data processing. So you've used Integration Services (SSIS) to integrate your data? Now it's time for SSAS. In this series you'll get started with the basics of how the Data Warehouse model of information works along with how to define dimensions and facts to build a Cube. 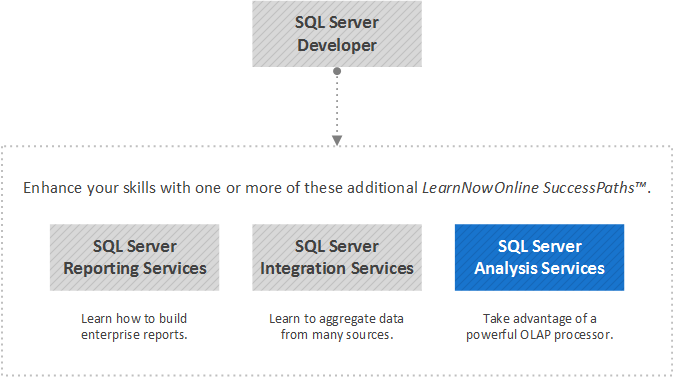 Then you'll refine it with SQL Server Data Tools and explore Perspectives and Key Performance Indicators. Once you're comfortable with a cube, you'll learn how to unlock Multidimensional Cubes, Degenerate Dimensions and how Cube Aggregations can assist in the indexing of attributes. As your data set grows, Usage Optimizer and Partitioning can help increase performance making the data usable by more people. With more people using it, Permissions and Security Roles can help make all your hard work secure. The Tabular Data model is an exciting feature for Excel users who love Pivot Tables. You'll see how to setup Tabular and improve measures using DAX (Data Analysis Expression). Learn about many new features like Time Intelligence and how easy it is for columns in the fact table to become attributes to slice and dice data. SSAS is an incredibly powerful set of tools. This success path will wrap up with Reporting, Datamining and Disaster Recovery coming soon.